The time is the late 1990s. The place: a high school. Two brothers, despite being a year apart in age, are in the same class. The younger brother, Jong-hyeon (Won Bin) is a good-looking, class-A fighter. The older brother, Seong-hyeon (Shin Ha-gyun) is unbelievably tender and gentle, a class-A student. They’ve been fighting, nearly non-stop for 17 years. Trouble began when their mother (Kim Hae-suk) favored Seong-hyeon over his younger brother. The conflict again began when both brothers fell for the same girl, the most beautiful girl in the neighborhood, Mi-ryeong (Lee Bo-yeong). “Hyeong” the word that younger Korea brothers call their older brothers. And yet Jong-hyeon has never said it to his brother. An older brother who feels sorry for his younger brother... Jealous over his rivalry for the same girl, embarrassed over the unequal treatments he received from his mother, but Seong-hyeon still longs for a close relationship with his younger brother. We were at some point in our life concluded that our parents treated our siblings better. Why their lunch boxes have richer contents than us? Why are they so dead-worried when our siblings suffer a minor cold? Why am I the one to be blame for the mistakes my siblings committed? Why our old folks savings seem to be reserved to our siblings? Contrary to the calculations and jealousy, there are equally many times when we would defend our siblings if they were in trouble, regardless of whether they are right or wrong. We never allowed others to talk coarsely about our parents and our siblings even though we were always the one who throw tantrums at them. 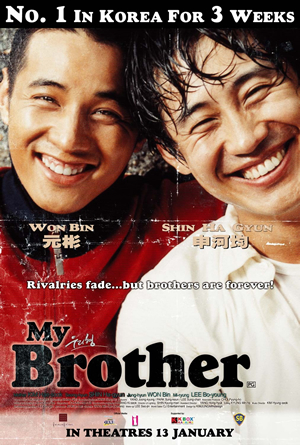 In the movie, "My Brother", Won Bin resembles most of us who may have overlooked the essence of siblings relationship. Reprising the "younger brother" role in his previous work "Brotherhood - Taegukgi", this time he is Jong-hyeon, an unsure and confused man beneath the handsome and fearless outlook. Longing for the attention of his divorced, loan-shark mother, who seem to be only concerned about her elder son, Seong-hyeon (Shin Ha-gyun), he is so jealous over the "fortune" of his elder brother that he refused to call him "hyeong", a Korean term commonly used by younger brother when they address their elder brother. However, Seong-hyeon (Shin Ha-gyun) is nowhere blessed since the day he was born. His father intended to throw him away because he was born ugly with a "hare-lips". He was unable to feed on his mother's breast like normal babies. His diction was affected and he grown up under the merciless needles that supported his fragile physics, an aftermath of his inborn deficiency. His medical treatment had led to the financial plight of his family that indirectly became one of the causes of break-up between his father and mother. Although he was constantly bullied by Jong-hyeon, he did not retaliate his brother's disrespectful behaviour and is patient and tolerant towards him. Naturalistically-intellect and the top student in the school, Seong-hyeon would go as far as casting aside his wrath even when he discovered Jong-hyeon uses his poems to win over Mi-ryeong (Lee Bo-yeong), the most beautiful girl in the neighbourhood, whom he is secretly admiring. Ultimately, the movie touted the concept that we never have a choice in which family we wanted to born into, neither do our parents have the choice in making a pre-selection to the quality of their flesh and blood. However, we became life-long burden, influencing each other in behaviours and beliefs. In spite of the challenges and differences that exist among us, for some unknown reasons, we always found refuge in the arms of our family in time of trouble. This movie is completed with valuable gems in almost every aspect. Probably the only shortcoming of the movie is the audio-recording equipments that were carelessly sneaking out from the corners in many scenes. Nevertheless, the heart-wrenching theme was intense enough to cover this negligence. Final words of advice: Start caring for your family from now on, or you may regret later for not having a chance when they are eventually gone.